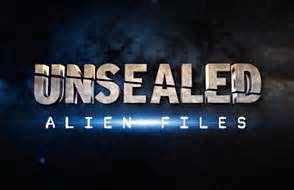 The "Alien Files" become unsealed again this Thursday when this Destination America series premieres its third season. The series "investigates recently released documents recording alien and UFO encounters, made accessible to the public in 2011 by the Freedom of Information Act. Based on this newly revealed information, the show re-examines key evidence and follows developing leads." This Thursday's episode looks into not only what UFOs are by exploring cases we may or may not be familiar with to "Are they spacecraft or vessels of a different kind, from a place beyond imagination?" The Space-Time Continuum is touched on and the question of whether UFOs travel vast distances to reach our planet, is discussed. Are they friendly? Are they maybe even a future us? Having seen the episode, I can highly recommend checking it out this Thursday, May 8 at 9 p.m. ET on Destination America. "Alien Files" offers a unique, 360-degree look at how alien interaction may have affected our past and how it will affect our future. Abductions, invasions, and conspiracies about aliens surround our world every day, from nightly news to video games to the latest box office hit. Delving into the "photo shopping" of space, the value of Wikileaks, and the role social media plays in alien stories.